So, yesterday was Halloween. We don't do trick-or-treating or anything like that, but we had our own little Halloween fun. 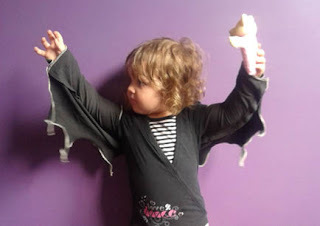 I sewed together some "bat wings" for E to wear around the house, following these instructions (found via Pinterest) and using an old t-shirt for the fabric. She certainly wore herself out 'flying' around like a bat. We read "Going Batty", by Charles Reasoner, which has been a favourite board book for quite some time. E loved to act like the bat in the book by saying "Boo!" too all her toys and going upside-down. It was surprisingly difficult to find Halloween stickers in the stores this year. There were plenty of generic costumes and horrible-looking candies, though. So that E could do a Halloween collage, I printed off a page of cute Halloween drawings (and drew a few of my own) and cut them out. Then E, armed with a glue-stick, stuck them onto some paper and added some details with coloured markers. She made two of these collages, one A4 size, the other A3. I've seen these little hand-print ghosts done various times before. Yesterday we had a go at making our own. E loves painting and making hand-prints. We simply used white paint on black paper. 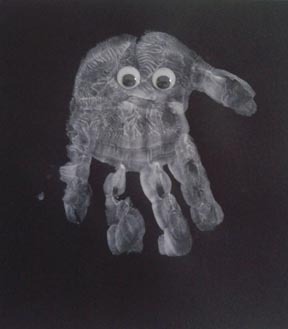 When they were dry, we added some googly-eyes and they were done. So simple, but so cute. While we had the paints out, E did some other paintings as well. I gave her some more colours to use and she painted using a combination of brushwork and finger or hand painting. The white-on-black for the ghosts worked really well, so I gave her a piece of red card to paint on using the white and that turned out really well, too. She still wasn't done with painting, so she did some (more colourful ones) on standard white paper, too. Earlier in the week, I had cut out some bat shapes from felt, thinking I'd make some bat-bunting or something. I never got around to finishing it, but E used the shapes and other felt scraps to make pictures on an un-cut piece of craft felt. I did make some Halloween-y paper toys. I made a little coffin (from here) which E liked filling with all kinds of treasures from gum-nuts to crayons to socks. I also made the "Li'l Death" from urban threads. 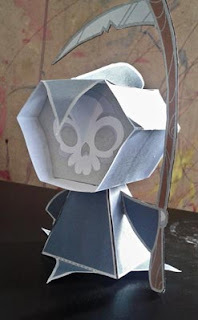 Unfortunately our printer doesn't print in black, so I made a white and greyish grim reaper. We definitely went for the 'cute' side of Halloween this year. 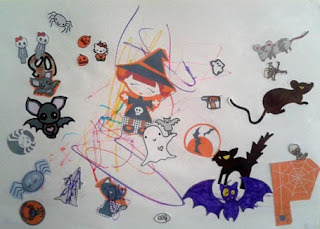 E was a bit worried by the little witch (a trick-or-treater, not much bigger than E) who came to our house, but she soon realised that the witch and her similarly spooky friends were friendly witches and such. E gave them a smile and a wave goodbye.